The demise of a lovely old Polish record label is a sad but salutary tale. Once upon a time Polskie Nagrania (simply, ‘Polish recordings’) was the state-sponsored company promoting Polish music and artists worldwide, the equivalent of Melodiya in Russia and Supraphon in what used to be Czechoslovakia. PN concentrated on classical composers and musicians, but was not so narrowly constricted as those other labels – perhaps, as it transpires, to their everlasting cost. In common with the other labels behind the Iron Curtain but peeking out beyond it, they had somewhat eccentric distribution arrangements and production values, or so it seemed to this then-teenage record collector, but that only made what you found more of a treat. 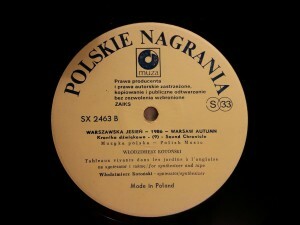 You won’t find this on Spotify: a Polskie Nagrania LP, yesterday. There were droopily impassioned, expressively constipated tone poems from Miecyslaw Karlowicz with Tristanesque titles such as Stanislaw and Anna or Returning Waves, perfect for sublimated teenage angst; pianists such as Adam Harasiewicz and Halina Czerny-Stefanska who would go on to make more famous (and doubtless more lucrative) records for Western labels, especially of ‘their’ Chopin; conductors such as Witold Rowicki who combined the disciplined intensity of the Russian school like Mravinsky with a cosmopolitan flair, even in the Austro-German classics (the same was true of the Czech Karel Ančerl and the Romanian George Georgescu); performances from the renowned Warsaw autumn of new music such as the LP above, which features Zygmunt Krauze’s Quatour pour la Naissance, written in response to Messiaen, and Tableaux vivants dans les jardins a l’anglaise by Wlodzimierz Kotonski (no, me neither); but the treasure I prized above the rest was a big box of Karol Szymanowski, who may be to Poland what Vaughan Williams is to England, forever influenced by an early training in Paris and yet utterly and distinctively native. Four LPs pressed on heavy dog-biscuit vinyl and a booklet of shiny paper that would crease if you so much as looked at it, in a rickety box which for all I know was made that way to stir the rarity-gleam in a record-buyer’s eye, a pale and interesting Henry James heroine of an LP set. Best of all, sellotaped to the inside front of the box was a single, of Szymanowski making a speech and giving an interview in a high, squeaky little voice. Maybe a house move took care of it, or could I really have broken the first commandment of a collector and actually lent something to someone? Either way, the set has disappeared, and now so has the label, liquidated for non-payment of debts and sold for a song (EURO1.9m – but PN has a lot of songs) to the local division of Warner Music. How did it happen? They scoured their back catalogue a few years back and came up with what looked like a ready banker, reissues of a singer, Anna German, whose mixed heritage brought her success in seven different languages and whose artless charm is no less a sound of the sixties than, say, Petula Clark. Alas, the executors of Anna German’s estate own the copyright to the recordings, and sued. PN couldn’t pay up. Record companies have a ‘label copy’ system that assigns a sheet or a file to every recording made, including all the details such as date, place… and ownership. Some companies keep their label copy more assiduously than others. Maybe a flash or desperate sales executive was told that PN didn’t own the recordings, and authorised the reissue anyway. But record companies now operate with such thin margins that a single claim can be fatal to a label of decades’ commercial standing. More pertinent is that the artist-copyright model of ownership is now almost ubiquitous. Wagnerian tenors of worldwide repute pay big companies to make records with them, not the other way around. The labels can’t/won’t take the risk because the return period is now a year, not a decade. And so, reasonably enough, the artists may decide to own the recording themselves too. Artist-led companies such as Avie and LSO Live do not pose a ‘threat’ to the major labels; they have been profitable for over a decade now. What’s over, with a very few innovative exceptions, is the era of the ‘back catalogue’. So will I ever see that Szymanowski set on DVD or download? Somehow I doubt it. Thanks for the memories, Polskie Nagrania.